There are many former NFL players swept into the dustbin of history who aren’t given their due. There are those that are victims of where they play as much as who they lost to that defined how they are remembered historically by the sporting press. Enter Robert Brazille. During the late 1970s the Houston Oilers were overshadowed by the perennial champion Pittsburgh Steelers and the players that comprised those teams that bested them in the ’78 and ’79 AFC Championship games. 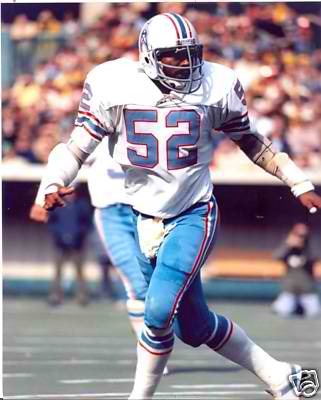 Whereas the Pittsburgh Steelers had one of the greatest strong side outside linebackers in Jack Ham in a 4-3 defense, the Houston Oilers fielded the epitome of the weakside linebacker in Robert Brazile for the 3-4 defense. Yet we must go back to NFL rule changes earlier in the decade that necessitated changes that had repercussions for years to come. The 1974 NFL season saw several rule changes, kickoffs were moved back to the 35 yard line, goalposts were moved to the back of the end zone and the hash marks were narrowed on the field. This brought the necessity for more speed to cover additional field at outside linebacker, where a new type of player was needed. Enter the thought process of deciding if it was best to go after the passer or cover the flank from the outside linebacker position. 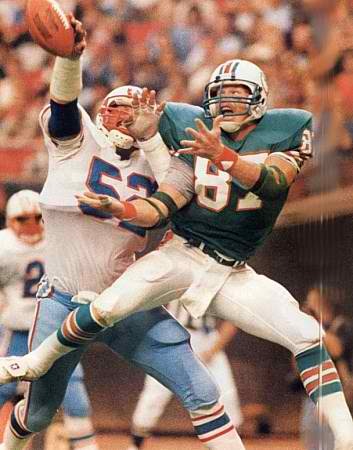 Several teams adopted the “53 defense” that the perennial champion Miami Dolphins instituted part time which saw DT Bill Heinz replaced with LB Bob Matheson, who wore #53, and could rush the passer as well as drop back into coverage. This change from 3 linebackers to 4 linebackers clogged the underneath passing routes. Many teams that were desperate for a winner went for this new tactical defensive adaptation of the old’50’s “Oklahoma” Bud Wilkinson defense full time. The 3-4 was just the old “Wilkinson 5-2” which had the two ends take their hand off the ground and become trackers. Robert Brazile was the first truly great outside linebacker that was based out of the 3-4 alignment and was the start of a new breed of linebacker. He was the 1975 NFL Defensive Rookie of the Year and broke the mold for what was expected from the outside linebacker position. He took home 5 defensive and rookie of the year honors. Before him, the Jack Ham 6’1 215 lbs outside LB, was the prototypical build, Brazile was the breaking of that mold weighing in at 6 ft 3 inches and 235 lbs. More like Bobby Bell and David Robinson from the 1960s. He was strong enough to take on offensive tackles and tight ends at the point of attack, speed to chase down ball carriers from behind and power to rush the passer. Brazile was the only player to make All-Pro from 1976-1980 at any position and was the player that the late George Young envisioned when he drafted North Carolina’s Lawrence Taylor. This talent, who was a collegiate teammate of Walter Payton, played at a time where sacks weren’t recorded as a statistic. It wasn’t until 1982 when sacks became official stats. Had this happened earlier, Brazile could have gained more acclaim as the best outside linebacker of his era. In fact do you realize Robert Brazile is a member of the all decade team of the 1970s as voted by the Pro Football Hall of Fame?? In fact he’s on their 2nd all decade team right next to Jack Lambert who is inducted, and remains the only linebacker within that group, not elected to the Pro Football Hall of Fame. An injustice that needs to be corrected. Again Robert Brazile was the prototype to the heavier more athletic linebacker, in a 3-4 defense, bred to cover a wider field circa 1974 to the present, that played with an intensity that Lawrence Taylor, Andre Tippett, Hugh Green, Rickey Jackson, and E.J. Junior carried into 1980’s stardom. Yet that notoriety started because Lawrence Taylor landed in New York and the sporting press lauded him as the greatest defensive player ever. Rightfully so… If that’s the case, what do you call or gauge the 7 time Pro Bowl, member of the All Decade team of the 70’s, 5 consecutive year All Pro linebacker selection he replaced and was patterned after?? The biggest difference is the Oilers didn’t realize what they had and should have sent him crashing off the corner more. He should have been blitzing 40 – 50% of the time. Even though statistics on sacks weren’t kept until 1982, he finished that year with 6.5 sacks when the strike shortened the year to 9 games. It was the last of his 7 straight trips to Hawaii. Robert “Dr. Doom” Brazile, an all time great that should not be swept into the dustbin of history because he played in Houston and not Dallas. The fact that the sporting press has failed to stand up for a great player who didn’t play for a great team or self promoted gives way to why we see those players who do. Understand this, the next time you see Clay Matthews Jr., James Harrison, LaMarr Woodley blitz off the corner from a 3-4 linebacker spot, you’re watching what started with Robert “Dr. Doom” Brazile in 1975 and not Lawrence Taylor and 1981. For the Hall of Fame, I present Robert Brazile… an all time classic. Postscript August 21, 2018: Just a few weeks removed from a glorious trip to Canton. He was presented by his father and Brazile let us know how he had lost the love of football and now the game was showing him it loved him back. 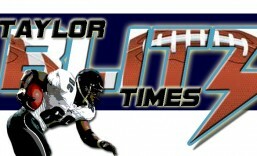 It was great to hear Lawrence Taylor share the phrase “He was LT before LT” …now where had we heard that before?? Even Black College Football Hall of Fame LB Thomas Henderson was in the house for Brazile’s induction and The Chancellor got to catch up to him. Its an honor for me that Brazile was the very 1st player written about in this series of all players who belonged in Canton who had yet to make it. Keep in mind when Brazile went into The Gridiron Greats Hall of Fame in 2016 the words of this article before this postscript was read to introduce him on that June night. It was great to catch up to him late in the evening after The Gold Jacket Dinner at the hotel, right as he was leaving the stage after the ceremony, and again at the airport as we were all leaving Canton. Congratulations on your induction and I told you I’d be there. You’re forever in the Pro Football Hall of Fame now. Thanks for reading and please share the article! This entry was posted in Defensive Formations, Historic Writings, Players Who Should Be In the Hall of Fame and tagged 3-4 defense, All Pro Team, Bud Wilkinson's Oklahoma Defense, Bum Phillips, football, Houston Oilers, Luv ya' Blue, NFL, Outside Linebacker, Pro Bowl, Pro Football Hall of Fame, Robert Brazile, The 53 Defense. Bookmark the permalink.